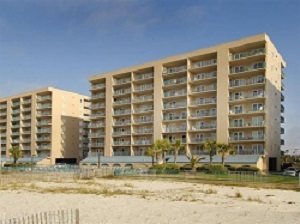 Gulf Shores beachfront condo for sale at Surfside Shores. This resort property has approximately 780 square feet and has been recently updated. This resort home is situated on the 2nd level, overlooking the pool, the sugar-white beaches of Alabama’s Gulf Coast, and the Gulf of Mexico. Great location, newly replaced HVAC ideal real estate investment – come see this condominium.